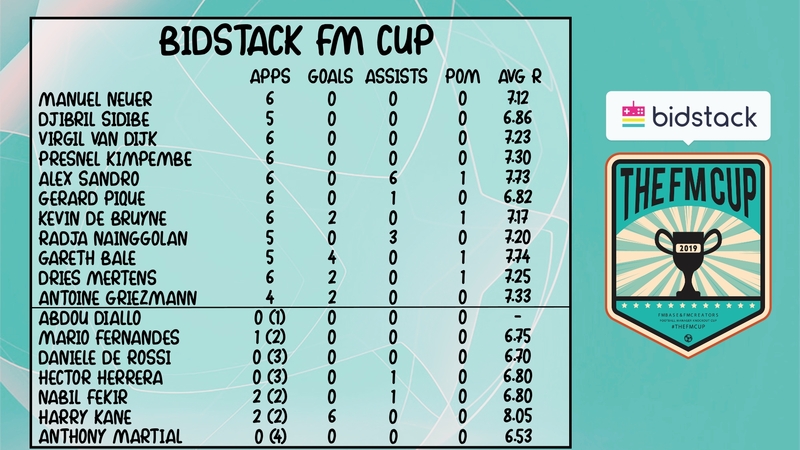 Back in October several well-known Twitter accounts in the Football Manager community began to advertise an upcoming tournament – the Bidstack FM Cup. I decided to enter the application process and I was lucky enough to be chosen as one of the 32 entrants. The tournament would be a Champions League style tournament and as such, each squad of 18 players would have to be chosen from this years (2018-19) Champions League squads. When picking my squad, it was of course tempting to select a squad with Ronaldo, Messi, Mbappe, Hazard, Neymar etc. But I wanted to challenge myself and I decided to follow the self-imposed rule of selecting a maximum of one player per club. If I chose Neymar I could not choose Mbappe for example. This rule actually made the selection process incredibly fun. 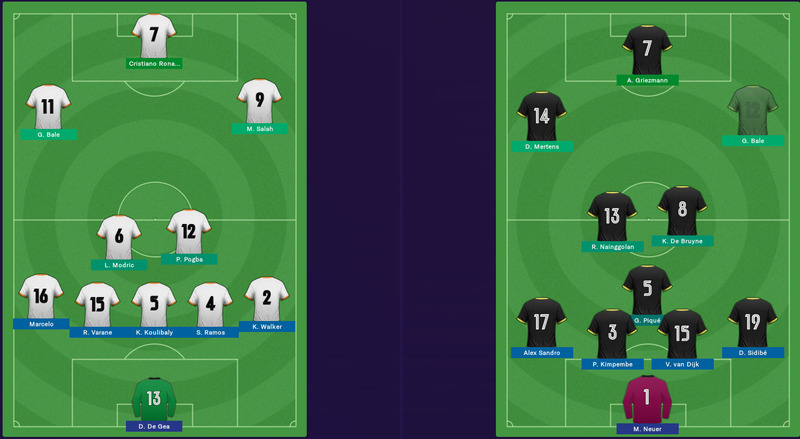 My first port of call was to create a formation and tactic that I would then be able to fit players into. I decided on the formation seen below. With the formation now chosen, I began to select my heroes, starting with the goalkeeper and working my way forward. I will run through the VivaLaVidaFM squad now. Goalkeeper was one of the easier positions to choose. I was between Jan Oblak (Atletico Madrid), David de Gea (Man Utd) and Manuel Neuer (Bayern Munich). I had picked Oblak to begin with, but I ended up selecting Antoine Griezmann later on and so I opted to choose Neuer as my keeper. Virgil van Dijk was almost an automatic pick for me. Though it would mean I couldn’t select Mo Salah, I wanted to build my team from the back by selecting the best possible defenders and for me van Dijk fits that bill. He will be my starting right-sided centre back and will most likely take the captain’s armband too. The left-sided centre-back was more tricky to fill. My first choice was Giorgio Chiellini of Juventus, however I wanted to use Alex Sandro as my left-back. I didn’t really want to use a PSG centre-back as I would have loved to have selected Kylian Mbappe, but Presnel Kimpembe was the best option for my CB partnership. Abdou Diallo was one of my final picks as I looked for a backup centre-back who could also play as a left-back. Dortmund were a team who I’d not selected a player from and so Diallo seemed like the perfect fit. In my tactic I’m deploying complete wing-backs – and so I want my wing-backs to have excellent attacking attributes. Djibril Sidibe certainly has those in abundance. Alex Sandro is perhaps one of my key acquisitions. He is physically monstrous and I’m hoping he will destroy teams down the left flank. He was almost overlooked in favour of Manchester City wing-back Benjamin Mendy, however I favoured Sandro and I haven’t regretted it since. Mario Fernandes is a gem of a player hiding in the CSKA Moscow squad. He will be my backup wing-back, but he is not too far off Sidibe for a starting place. 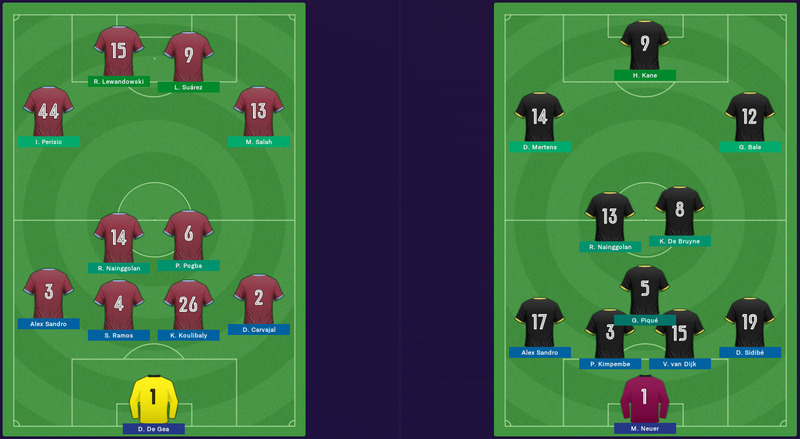 I had great success using a half-back on FM18 with Ostersund and I was eager to use one in my tactic for the Bidstack FM Cup. Gerard Pique is exactly the type of player I want in this role. Despite not being fully able to play as a DM, his attributes tell otherwise and as such I think he will play a crucial role in our team throughout the tournament. With determination and leadership of 20, Daniele de Rossi can lead our squad from the bench. He will play a backup role to come on and lead our team in the dying embers of matches – provided added freshness to push for victory or hold on to a lead. His experience could be vital. After electing to choose Alex Sandro instead of Benjamin Mendy, I was able to choose a more attacking Manchester City player. I was tempted by David Silva, but felt that Kevin de Bruyne offered just a little more to the team. When searching for a box-to-box midfielder Nainggolan was the player who met the parameters I set. He was a certain pick once I had checked that Inter Milan were in the Champions League! He is solid all round and will be a perfect pairing with the more creative de Bruyne. Hector Herrera is the clear backup central midfielder and I wanted a player who was decent both offensively and defensively. He was also one of my final picks and so I didn’t have many teams left to choose from. He is, nonetheless, a very capable backup and I’m sure he will end up coming on when looking to close out a victory. As soon as I’d decided on playing with an inside-forward, Gareth Bale was the first name on the teamsheet. This, of course, meant that there would be no Luka Modric, no Toni Kroos, no Marcelo. But Bale is a match winner and can be deployed on either wing and up top. Dries Mertens will be my starting left winger. His excellent attacking attributes will hopefully serve me well throughout the tournament. With Alex Sandro as our left wing-back, I’m hoping that our left side will blow teams away. We’ll see! Anthony Martial crept into our squad as a replacement for Paul Pogba. I always wanted Martial in my squad and with de Bruyne and Nainggolan definitely starting, I’d rather have Martial on the bench instead of Pogba. Manuel Neuer can thank Antoine Griezmann for his place in the side as my selection of the French international pushed Jan Oblak out of the squad. Griezmann is a quality striker who should bag goals aplenty. He, too, is a very versatile player who can be deployed in all three attacking-mid positions. Probably the perfect backup striker, Harry Kane. He will feel aggrieved not to be starting, but he will definitely be able to impact games from the bench. Nabil Fekir is the final player to speak about and he could be a brilliant player for us to use from the bench. He’ll most likely be used as a player to come on when chasing the game, but equally he could come on as a Bale replacement should the Welshman underperform / pick up an injury. The Bidstack FM Cup group stage was drawn and I was drawn into Group G alongside BigDadyHam, Curtis Beasley and FMMariner. You can find their Twitter’s through the links! Each team would play each other twice, once at home and once away. The top two from each group would go through to the knockout stages, just like the Champions League. Going into the tournament I didn’t really know how my team would play. I’d played only one friendly – against MikaelinhoFM – and lost 2-0. Here is the starting XI’s of both sides, Curtis Beasley on the left and VivaLaVida on the right. The first half of my tournament went so much better than I could ever have imagined. Dries Mertens was offered an early opportunity to take the lead from the penalty spot, which he duly did. Shortly afterwards Kevin de Bruyne made it 2-0 with an effort from outside of the area. Dries Mertens added his second and our third after just 19 minutes before Antoine Griezmann made it 4-0 before half-time. 4-0 up at half-time and the game was pretty much won. Or was it? Curtis Beasley came out fighting in the second half and dragged back the deficit to only two after goals from Giorgio Chiellini and Cristiano Ronaldo. Curtis’ side were truly dominant for the remainder of the half and we were lucky to keep our lead until the final whistle. We saw our woodwork hit 3 times as Curtis’ side pressed high and tried to level the scores, but it was not to be. VivaLaVida ran out 4-2 winners. Gareth Bale had to come off injured during the match which means he will be unavailable for the next match against Curtis. 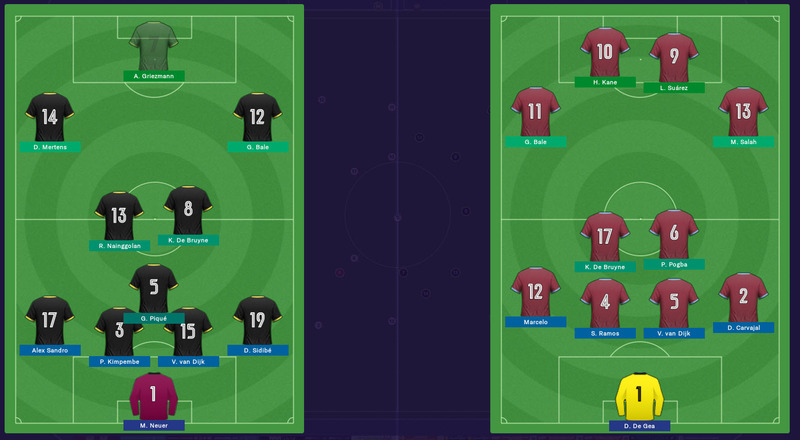 One of the problems several of the participants of the Bidstack FM Cup have found is that FM Touch occasionally freezes during matches. This happened during the second game vs Curtis. Luckily the freeze happened with just two minutes to go and the game tied at 1-1 and so the outcome wasn’t badly affected, but what it did mean is that the game did not save and therefore I wasn’t able to grab any footage from the game. With Gareth Bale out injured from the previous game, Nabil Fekir came into the team as his direct replacement out on the right wing. No other changes were made to the starting XI. Unlike the first game, we dominated this game with countless shots on goal but it was Curtis who nearly stole the match after Griezmann scored their opener. 1-0 down and heading into the final minutes, I went very attacking and it paid off, with substitute Harry Kane scoring an equaliser in the 91st minute. It was shortly afterwards that the game froze and a draw was mutually agreed. 4 points from my first two matches – I’m more than happy with that! Another good couple of performances here would go a long way towards qualifying from the group stage! 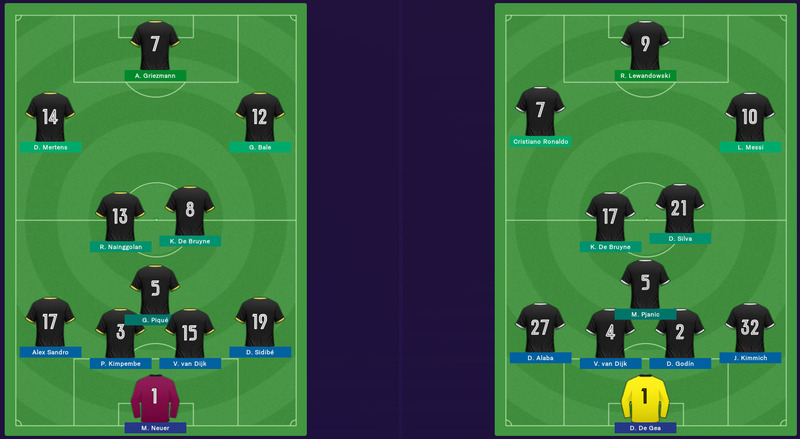 Going into game three confident after the first two performances, I decided to keep the starting XI from the first match of the tournament – Bale comes back in to replace Fekir. The game began in similar fashion to our first match vs Curtis Beasley, though this time it was an own goal that gave us the lead. We followed that up with a goal through substitute Harry Kane, who came on to replace an injured Antoine Griezmann. Kane is determined to oust Griezmann for future matches, netting a third goal in two games. Gareth Bale rounded off an incredible and dominant performance, scoring his first goal of the tournament with a powerful header at the back post. An incredible victory moves us onto seven points from three games, a great position to be in midway through the group stage. With Antoine Griezmann out injured, Harry Kane earned a start as the only change to our team. FMMariner made a couple of changes in attack fro the first leg that paid dividens immediately. Robert Lewandowski latched onto a through ball from Ivan Perisic to score the opener before a terrible mistake from Manuel Neuer let Lewandowski score a second. Despite going down 2-0, I was still confident in my team to comeback that I decided against making changes. Harry Kane continued his good form to score two goals to bring us even with FMMariner. With five minutes to go, I would most definitely have settled for a draw and eight points from four games. Sadly this was not to be, with FMMariner’s Harry Kane scoring their third of the match in the 87th minute. Throwing Gerard Pique up top as a target man was not enough to salvage a draw and Mohamed Salah added a fourth to secure victory for our opponents. Despite losing, we still were good enough to get something from the game and had chances to go ahead whilst at 2-2. With two games left in the groups, having 7 points is a good position to be in. 1 win from the final two games will hopefully see us progress to the knockout rounds. With just two matches to play and 7 points on the board, the group was far from done, especially as by this point BigDadyHam had yet to play any group fixtures. A win and a draw from these two matches should be enough to earn qualification, but the ideal scenario would be to beat BigDadyHam twice and then hope he can take points off FMMariner. I decided to stick with my original best eleven despite the temptation to play Harry Kane instead of Antoine Griezmann. 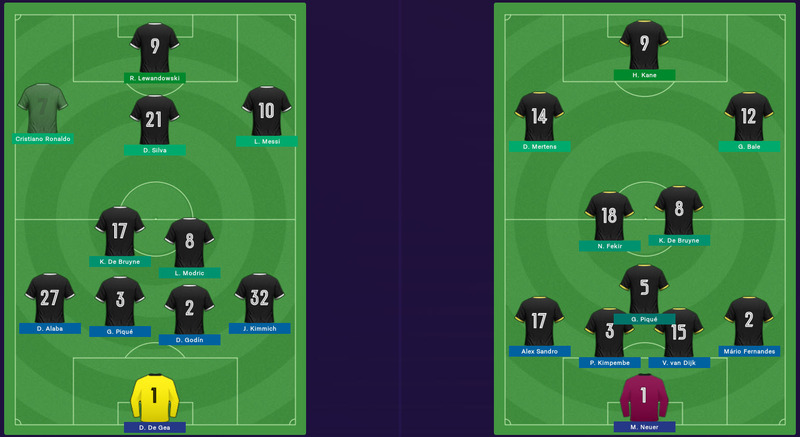 BigDadyHam lines up against me playing the same formation and he boasts Lionel Messi and Cristiano Ronaldo on either wing. My faith in Griezmann paid off almost immediately as we took an early lead through the French striker. Gerard Pique had a shot from the edge of the area deflected into the path of Griezmann, who slotted home. We held our 1-0 lead until later in the second half. Alex Sandro whipped in a ball that was too tricky to defend – the ball ricocheted off Godin into the back of the net for 2-0. At 2-0 and looking comfortable, we really stepped up our game and Welsh star Gareth Bale scored a brace to give us our second 4-0 win of the group stages. A solid performance releases the pressure somewhat and allows us to go into match 6 feeling slightly more comfortable, knowing that a point will most likely see us progress through to the knockouts. The return leg saw a couple of changes for the VivaLaVida starting XI. I decided to bring in Mario Fernandes as our right back to help nullify the pace of Ronaldo on the left wing. In the middle I swapped in Nabil Fekir for Radja Nainggolan and Harry Kane earns a start up front. The opening goal came from our roaming playmaker Kevin de Bruyne – an impressive direct free kick that nestled in the top corner. Gareth Bale scored his third goal against BigDadyHam with another finish at the back post. BigDadyHam brought the game back to 2-1 before substitute Anthony Martial won a penalty, which Harry Kane converted. This win surely sees us qualify for the knockout rounds. Two excellent performances to end the group stage – I’m very pleased with how our team has nullified the likes of Messi and Ronaldo whilst still being able to press forward in attack. The next post in this series will be a review of the knockout stages, hopefully I can go all the way to the final! We shall see. Thanks for reading this summary of the first stage of the Bidstack FM Cup. Do feel free to follow me on Twitter: @VivaLaVidaFM or you can follow this blog as shown below. 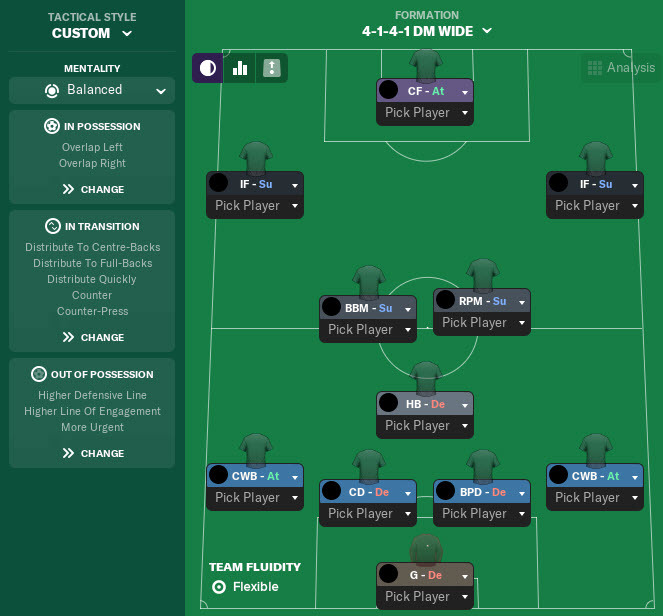 This entry was posted in Bidstack FM Cup, Football Manager 2019 and tagged Bidstack FM Cup, fm19, football manager. Bookmark the permalink.